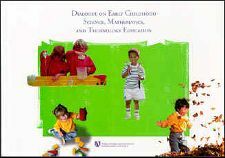 This publication and the February 1998 Forum on Early Childhood Science, Mathematics, and Technology Education were supported by a grant from the National Science Foundation (grant number ESI 96189093). Any interpretations and conclusions are those of the authors and do not necessarily represent the views of the American Association for the Advancement of Science or the National Science Foundation. All rights reserved. No part of this publication may be reproduced, stored in a retrieval system, or transmitted, in any form or by any means, electronic, mechanical, photocopying, recording, or otherwise, without the prior permission of the AAAS. Cover photos: Young boy playing: Cummins, Jim/FPG International, LLC. Boy planting tree: Taposchaner, Jacob/FPG International, LLC.